The story of Ballindalloch Castle is set out in our feature page about it. On this page we focus on the attractions beyond the castle itself, in particular the gardens and surrounding parkland including the river walk. Full information about opening hours and admission prices can be found on our Ballindalloch Castle feature page. The Ballindalloch Estate covers a significant chunk of this part of Speyside, and economic activity ranges from forestry and agriculture to shooting, fishing, stalking and a 28 turbine wind farm. Ballindalloch is, for example, home to the oldest herd of Aberdeen Angus cattle in continuous existence anywhere in the world. Meanwhile the estate's barley production helps feed both its own livestock and the area's distilleries. 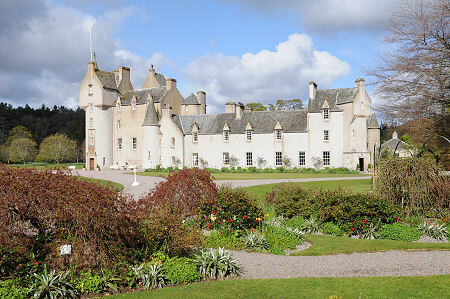 From a visitor's point of view, however, with one notable exception discussed below, the most interesting parts of the estate are those immediately around Ballindalloch Castle itself: though we use the word "immediately" in a fairly loose sense as the castle grounds extend for nearly a mile and a quarter from the Bridge of Avon to the banks of the River Spey. Within the grounds you find three very distinct gardens, a duck pond, a significant river frontage along the River Avon and a lesser one along the River Spey, and other attractions intended to ensure that everyone in the family has an enjoyable day out. Plus the tea room and shop, and not forgetting Ballindalloch Castle itself, of course. You reach Ballindalloch Castle from the well signposted turn off the A95 a little over half a mile north of its junction with the B9008 from Tomintoul. The drive descends into the joint valley of the Avon and Spey, and leads you round so you approach the castle itself from the north, parking in the area beyond the rather fine doocot, which dates back to 1696 and comes complete with 844 stone nesting boxes. Admission ticket are either to the castle and grounds, or to the grounds only. Frankly, Ballindalloch Castle is such a wonderful place, no-one should fail to visit the castle itself: but the grounds probably have more attraction for repeat visitors, either enjoying what is on offer again, or simply seeing the passage of the seasons in the gardens. Essential to getting the most from your visit is the map of the gardens and grounds you will have been given on arrival. Some elements of what is on offer are immediately obvious from the car park. These include the grass labyrinth and dog walking area. This is as good a place as any to learn the difference between a labyrinth on the one hand and a maze on the other: the labyrinth has only one possible course through it, while it is possible to become lost in a maze. Next to the labyrinth is a large and superbly equipped children's play area, which comes complete with a wonderful collection of plastic vehicles for younger children to play in or on. As with every other aspect of your visit to Ballindalloch, the attention to detail is highly impressive. The nearby tennis court has been converted to house a pedal kart track, while on the other side of the car park is a paddock area which, when we visited, was home to two llamas. There is also a duck pond. For anyone wanting to stray a little further afield, the grounds map sets out a number of walks, including one that takes in stretches of the banks of the River Avon and the River Spey. Another walk passes by the enclosure set aside for the current herd of Aberdeen Angus cattle. There are three gardens at Ballindalloch. Off to one side of the large lawn that extends out from the front of the castle is the rockery, which climbs up the lower slopes of the valley of the River Avon. This can be enjoyed in its own right, and it also offers fine views of the castle. Meanwhile, a path from the north east corner of the castle leads to the walled garden. This path is in itself a fascinating experience as, especially if you are the first person to have walked it in a while, it is a great place from which to view red squirrels, both on the ground and in the trees. The walled garden has a central fountain as a focal point, and a nice line in cherubic statuary. 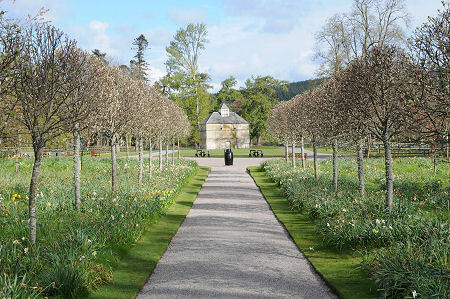 It is also home to Ballindalloch's rose garden. The walled garden was redesigned in 1996 in celebration of the 450th anniversary of the castle. Closer to the rear of the castle is a laburnum arch, or tunnel, and to the immediate rear of the castle, enclosed on three sides by the building itself, is a very formal courtyard garden. Ballindalloch Castle also has its own championship standard golf course, designed by Donald Steel and Tom Mackenzie. The course comprises nine holes and eighteen tees, and aims to provide a fair test for golfers of all standards. The aim is for it to become known as the finest course in Scotland set out in this particular arrangement. It is reached from the A95 a mile or so south east of the access to the castle grounds. Owned by the estate on the opposite side of the River Spey (and not publicly accessible) is Pitchroy Lodge, used to provide fishers and sporting parties with high quality accommodation. The lodge's main claim to fame is that Captain W E Johns lived here from 1947 until 1953. While living here he wrote numerous books, including at least 15 of his classic Biggles novels. 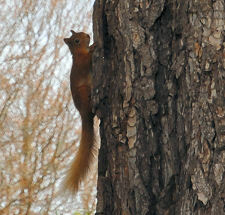 Located within the grounds of Ballindalloch Castle. See our Ballindalloch Castle feature.